We’d love your help. Let us know what’s wrong with this preview of Designing Your Life by Bill Burnett. Their phenomenally successful Life Design course has been tried an Whether we’re 20, 40, 60 or older, many of us are still looking for an answer to that perennial question, ‘What do you want to be when you grow up?’ In Designing Your Life, Silicon Valley design innovators Bill Burnett and Dave Evans use their expertise to help you work out what you want – and how to get it. To ask other readers questions about Designing Your Life, please sign up. Is the book suitable for teenagers? I read a few pages and I think it is intended for people with a career. I actually thought this was going to be more about life rather than focusing on just work. Dschool and DT apologists will insist that this stuff can be applied to life too, but that's a farking load of steaming hot BS. It's about work. Full stop. And, sure, okay, the method in the book probably works for that...or at least a fairly narrow sub-set of highly skilled and highly valued workers in large urban areas. People who are basically on track for a good career no matter what. For people who a) I actually thought this was going to be more about life rather than focusing on just work. Dschool and DT apologists will insist that this stuff can be applied to life too, but that's a farking load of steaming hot BS. It's about work. Full stop. And, sure, okay, the method in the book probably works for that...or at least a fairly narrow sub-set of highly skilled and highly valued workers in large urban areas. People who are basically on track for a good career no matter what. For people who a) may not be the top in their class, b) may be pursuing careers outside tech and big business, or c) may find themselves in a smaller city or rural situation are NOT going to profit from this, except to realize what choices they don't have and what lives they'll NEVER lead. For the rest of us, it's kind of...meh. However, it did take me back to my three-option five year plan from grad school which started with the quote: "Sometimes I can hear my bones straining under the weight of all the lives I'm not living." So I don't disagree with them 100% - I just don't see very much of real value here for people who aren't over-anxious, confused, or indecisive one-percenters. Overall, over-hyped business book. Blah. 4. Now ask yourself if it's a problem of 'gravity' (not one that's gonna change). - What you are doing. 1. Complete a log of daily activities. Not when you are energized and/or engaged. 4. Are there any surprises in your reflections? 6. AEIOU method (Activities, Environments, Interactions, Objects, Users). Reframe: Focus on the hiring manager's need to find the right person. Actively seek and co-create your dream job. The concept behind this book was great - applying Design Thinking to designing your own life. But The actual content was fairly light, fairly uninstructive, and, to be frank, quite unaware of its own privilege. To apply the concepts in this book, you have to have the financial and personal capacity to put the ideas into action. The issue that the book displays no awareness of this fact. What an excellent read! This is going to be my "Christmas of 2016" gift for friends and family. There's the reframe of a dysfunctional belief or Life Design tip for everyone inside. It's especially timely for the recent grad, the restless mid-career professional, or the encore passion seeker ready for a change. Admittedly, I've been a Design Thinker for awhile, so the concepts here were not too foreign to me, but the application of them for my personal life very much was. Curiosity and prototypi What an excellent read! This is going to be my "Christmas of 2016" gift for friends and family. There's the reframe of a dysfunctional belief or Life Design tip for everyone inside. It's especially timely for the recent grad, the restless mid-career professional, or the encore passion seeker ready for a change. Admittedly, I've been a Design Thinker for awhile, so the concepts here were not too foreign to me, but the application of them for my personal life very much was. Curiosity and prototyping are a crucial part of discovering what makes you happy in life, and DYL reminded me of that. Designing Your Life is not a manual, it's an actual toolkit with worksheets and activities for you to do on your Life Design Journey. I have already read it a few times, and know I'll be coming back for years to come. just have to muddle through somehow. I wish I had been diligent enough to write down my mental models of the world and publish them in book form. Luckily, in "Designing Your Life", Burnett and Evans have already done all the hard work for me! The nuggets-to-fluff ratio is pretty high and they hit most of the high points. This is required reading for all college students. * Forget your "passion". You hav I wish I had been diligent enough to write down my mental models of the world and publish them in book form. Luckily, in "Designing Your Life", Burnett and Evans have already done all the hard work for me! The nuggets-to-fluff ratio is pretty high and they hit most of the high points. This is required reading for all college students. * Forget your "passion". You have no idea what your passion is. Explore! * There is no right choice - only good choosing. The worst choice is decision paralysis. * Applying for jobs is ridiculous. Go meet people, be interested and interesting, and solve real problems. * Know the game you're playing. Success disasters are real. * Failure is just the raw material of success. You're not going to starve under a bridge. Be bold and get to work. * Only worry about the things you can control. * Happiness is letting go of what you don’t need. This book is excellent at *what it does*, which is providing a framework for thinking and working through major career changes. Even though I'm not looking for a new job, I found plenty of useful exercises to sink my teeth into, allowing me to imagine my way forward into new approaches within the job I do have. So why only three stars? Poor expectation management: It's not entirely clear from the title or the blurb that this book is exclusively about designing your career, and when I started read This book is excellent at *what it does*, which is providing a framework for thinking and working through major career changes. Even though I'm not looking for a new job, I found plenty of useful exercises to sink my teeth into, allowing me to imagine my way forward into new approaches within the job I do have. Hearing a story about this book on NPR motivated me to purchase Designing Your Life: How to Think Like a Designer and Build a Well-Lived, Joyful Life. In all, I am pleased to have purchased and read this book. First, it gave me a different lens by which to view my life. Second, it allowed me to look at my youngest child and see how she is a natural born designer, and increased my desire to nurture her approach to life. The book is to-the-point and easy to read, combing ideas with real life stori Hearing a story about this book on NPR motivated me to purchase Designing Your Life: How to Think Like a Designer and Build a Well-Lived, Joyful Life. In all, I am pleased to have purchased and read this book. First, it gave me a different lens by which to view my life. Second, it allowed me to look at my youngest child and see how she is a natural born designer, and increased my desire to nurture her approach to life. The book is to-the-point and easy to read, combing ideas with real life stories with exercises. As I read this book I realized that my work-life situation is close to ideal. Yet the book seemed heavily weighted to analyzing and adjusting your work/career situation. Personally I could have used more assistance with enhancing the "play" portion of my life. I did make a mental note to refer to this book should I decided to have an encore career or change career directions later in life. Designing Your Life offers some useful tips in regard to making changes. While it can apply to other areas, the majority of the book focused on career applications which is practical, since the majority of us tend to spend most of our time at work. There was useful information throughout the book that I think can apply to most people seeking some type of change - small or drastic, but I personally didn't think the tips were groundbreaking or crazy game changers. Just ways to reframe some of the Designing Your Life offers some useful tips in regard to making changes. While it can apply to other areas, the majority of the book focused on career applications which is practical, since the majority of us tend to spend most of our time at work. There was useful information throughout the book that I think can apply to most people seeking some type of change - small or drastic, but I personally didn't think the tips were groundbreaking or crazy game changers. Just ways to reframe some of the deep daunting questions of being an adult and trying to achieve a professionally fulfilling life. While I can come up with a few groups who might not benefit from this book, I would think in general most would take away something to help them in their approach to life. The authors provide helpful anecdotes, exercises, and insight to guide the reader on the path of living intentionally. As a Christian, I understandably found the lack of spirituality and reliance on self didn't fully align with my worldview. However, this book is a framework, and I think with thoughtfulness can be used by peopl While I can come up with a few groups who might not benefit from this book, I would think in general most would take away something to help them in their approach to life. The authors provide helpful anecdotes, exercises, and insight to guide the reader on the path of living intentionally. As a Christian, I understandably found the lack of spirituality and reliance on self didn't fully align with my worldview. However, this book is a framework, and I think with thoughtfulness can be used by people with spiritual beliefs or persuasions and catered to include those frameworks. I don’t know why authors choose to release audio versions of their books but fail to hire professional narrators. I’ve yet to listen to a book in which the author read his/her own work & I thought the performance couldn’t have been improved upon. This was an especially bad decision for this book. The authors are university professors & their performance (imo) felt like a lecture. Blah blah blah Stanford.... blah blah Stanford. I found the material although common sense for some of us is not necessary easily applied for others. The authors seemed completely unaware of their societal privilege. If you can ignore the many Stanford references, the authors lack of awareness, & are a professional in a metropolitan area the material may be of help to you. If you’re interested in the material but aren’t sure you can easily dismiss what some reviewers have called bragging or snobbery but I think is just lack of societal awareness perhaps skip the audible version read the book or just use the corresponding workbook. I’m not a fan of non-fiction so I’m unsure of the audible or the Material itself is to blame 😑 Whatever the reason, I found finishing this book a true challenge. One I failed miserably at I might add. That’s right DNF. FYI this book’s focus is on career as such most of the examples are on professional choices but the concept is applicable to daily life as well. I imagine the class would be beneficial & very popular but being I only listened to the audible & used the workbook I’m limited to rating those. I was excited to read this book as I have hope that it will give me a step-by-step guidance on how to design the life I want. Yes, it did give me that. But I find that the explanation leans more towards mechanical process and how to, to an extent that it lacks the warmth of story-telling that I love. They do share examples of experiences and stories of other people related to the topic of discussion but for me, the stories didn't stick. However, let me share a few interesting notes in the book that I was excited to read this book as I have hope that it will give me a step-by-step guidance on how to design the life I want. 2. Reframe your mind and how you look at things, see things in various angle and take different approaches. Ask a stranger or someone you're not close to for their opinion, once in a while to get fresh perspective. 3. Life is a process, a journey. Instant gratification will not lasts. Be patient. Things change, people change. Accept and adapt. هو ده الكتاب الي تقدر تقول عليه فعلا كتاب تنمية ذات . I give it 5 stars because the concepts and ideas in it are so powerful and positive. Majority of them aligned perfectly well with even my faith. There are concepts and ideas that when you learn will make life interesting to you just by knowing that there are actually people who think a certain way or have a certain point of view on the same things that once seemed daunting for you which will make the same things exciting for you. I was so excited and hooked throughout the entire book until the end I'm writing this review at 3.27 a.m.
What got me even more excited is that while reading the book I would get ideas to implement I would stop reading and go implement them right away only to discover that at the end of the chapter they are the very ame things the authos suggest to do. I have already recommended this book to 6 of my friends. Created a what's up group for 4 of my friends and we will embark on it together. Right now what is left for me is to get some prototypes ready for my parallel lives to experiment with and then delve into the most exciting one. You guys have done a tremendous job. I approached this book with a healthy dose of skepticism, reserved for all books in the 'self-help' genre. I was curious to give this book a try as it was based on a very popular Stanford course. True to its reviews, this is quite an exceptional book. Though, none of the ideas written here are particularly revolutionary, they are just written in such a approachable, easy, and convincing manner you can't help but be engaged. I already see myself thinking differently about my future and life choic I approached this book with a healthy dose of skepticism, reserved for all books in the 'self-help' genre. I was curious to give this book a try as it was based on a very popular Stanford course. True to its reviews, this is quite an exceptional book. Though, none of the ideas written here are particularly revolutionary, they are just written in such a approachable, easy, and convincing manner you can't help but be engaged. I already see myself thinking differently about my future and life choices. Insipid and deceptive. I expected something more rigorous: the application of design thinking principles to life-planning. Instead this was 5% design and 95% the same content as every other self-help potboiler. Stanford should be upset that the authors' market this book as the content of a course taught on their campus. Because this is at most the content of two lectures, not at all what would be expected over an entire semester. This book is a bit like a mind map - there are tons of creative ideas, but it isn’t organized into a coherent whole. It’s helpful for brainstorming your “life design”, but it also feels like a jumble of random blog entries. Want to take one of the most popular courses at Stanford University? Well, you can, almost. 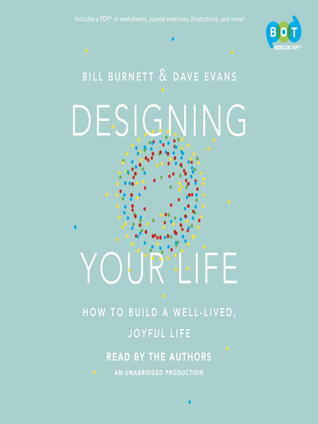 “Designing Your Life” is based on the course taught by Dave Evans and Bill Burnett at Stanford the past 10+ years. Their methodology is rooted in design thinking, a human-centered process for solving problems. Design thinking prioritizes empathy for the user as well as a bias toward action in generating ideas and prototyping representations of those ideas, designing your way forward. What if you applied de Want to take one of the most popular courses at Stanford University? Well, you can, almost. “Designing Your Life” is based on the course taught by Dave Evans and Bill Burnett at Stanford the past 10+ years. Their methodology is rooted in design thinking, a human-centered process for solving problems. Design thinking prioritizes empathy for the user as well as a bias toward action in generating ideas and prototyping representations of those ideas, designing your way forward. While swiftly walking through my neighborhood with a couple friends, talking and hopping from topic to topic like we were speed dating with a three minute limit, I mentioned thoughts of heading back out into the world of the employed; however, with no planned direction, which is when this book was recommended by one of the friends. The co-authors, who have extensive technical backgrounds, morphed from corporate work to collaborating material for the popular Design Program at Stanford to a brand t While swiftly walking through my neighborhood with a couple friends, talking and hopping from topic to topic like we were speed dating with a three minute limit, I mentioned thoughts of heading back out into the world of the employed; however, with no planned direction, which is when this book was recommended by one of the friends. The co-authors, who have extensive technical backgrounds, morphed from corporate work to collaborating material for the popular Design Program at Stanford to a brand that includes the book, a website/blog, broadcasts, and workshops. Job seekers would benefit from reading it; however, anyone can choose an area of their life and apply it. It was a fun read with lots of common sense tips that we tend to forget when eager or anxious for a life change. Also, lots of the latest business buzzwords and techniques are included. Each reader will take way something from the book. This is the sentence that summed it up for me: "When you remember that you are always playing the infinite game of becoming more and more yourself and designing how to express the amazingness of you into the world, you can't fail." I found the book to be helpful and worth reading. Many of the points they made were things that I'd previously considered, but they elaborated or reframed many of them and, especially important to me, encouraged you not to dwell on or agonize over things. For me, it helped refocus my attention different aspects - let's hope I can keep it up! I checked the book out of the library and it really is best completed as a workbook, which is difficult when I only had the book for two weeks. For example, I found the book to be helpful and worth reading. Many of the points they made were things that I'd previously considered, but they elaborated or reframed many of them and, especially important to me, encouraged you not to dwell on or agonize over things. For me, it helped refocus my attention different aspects - let's hope I can keep it up! I have taken a 1-day version of design your life class and it was incredible. The book is even deeper and lasting. This book touches on both philosophy and practicality. Good to have it as a guide to live a well-lived life. The book invites us to approach life with the curiosity of a designer and to prototype without fear of failure. The last chapter has been the most enlightening of all; the mind-sets described therein will guide us all along the way. It took me so long to finish this book because I'd get caught up in trying to perfectly complete all the worksheets & exercises. (Update: I didn't, but I made sure to write a little bit or reflect about each end of chapter exercise). Also you can only digest so much of a self-help/life-improvement book at a time. Anyway, a recommendable book with a calming, encouraging, and thoughtful tone about living your best life. I particularly liked all the real life examples they gave. Als YAS I DID IT. Anyway, a recommendable book with a calming, encouraging, and thoughtful tone about living your best life. I particularly liked all the real life examples they gave. Also the latest book design (it's light blue) from the font to the titles to the diagrams to the cover is just very visually pleasing. Like I got it from the library but I'd wanna buy it because it'd be nice to have. Highly recommended for its practical, no BS approach to life design. No “you can do it” mantras, just lots of exercises, from energy/engagement logs to brainstorms on your possible futures. Very solid thoughts and practical advice on career, finding a job, and making it a dream job. You will get out of this book as much as you will put into it though, so don’t skip the exercises parts. This book is rich and will take a while to work through it, but it will be well worth it.